Even though by some standards I was excelling in the game, for years I had felt as though I wasn’t tapping my potential. How did I know this? I would hold back on my shots when the score became close. I would miss my best shots that I made in practice just a day before. I would lose matches after leading. I found myself worrying constantly whether I would win or lose a match, which often made me nervous and play worse. After years of periodic frustration, curiosity, and armed with a degree in both clinical and sports psychology, I landed on what I believed was the root of the problem—fear. Fear of making a mistake. Fear of a “missed opportunity.” Fear of losing. Fear of my own disappointment. Fear of not receiving validation from others. When I finally faced the truth about what I was choosing to do on the court and became aware of my unrestrained ego, my experience in competition began to shift. As you can imagine, this process involved some self-reflection. As I did this, questions began to emerge. What might I be capable of if I didn’t hold back? This was almost enough for me. But, there were more questions. What’s different about me when I’m playing my best? What does it really feel like when I’m loose? Do I really have as much to lose as I think? Don’t I actually lose more and feel worse when I play tentatively anyway? At an even deeper level, having given my heart and soul into the game for years, an even deeper fear emerged. What if I were to regret the way I played the game when I stop competing one day? This thought shook me to the core. Add to this the numerous and painful matches we all viewed among the game’s elite. Mal Washington blowing a 5-1 lead in the fifth set in the semi-finals of Wimbledon against Todd Martin. The infamous match where Novotna served at 5-1 in the third set of the U.S Open Final and lost. The list goes on and one. “Even the best choke, too,” I thought. Fascinating. What is going on here? And how much control do we really have? “There it is again,” I thought. As I am sure you know, I was certainly not the only one confronting this. It was happening everywhere. It didn’t take me very long to figure out that if I was going to accomplish my desire of experiencing the feeling of tapping my potential and feeling good about it along the way, a new paradigm had to emerge. After contemplating my recent epiphanies about how fear was impacting my mind and my game, and seeing how this thought process pervaded the psyche of almost anyone I came in contact with, I began to get excited about going against the grain. “If virtually everyone I know is fixated on winning or losing,” I thought, “then I’m going to take another tact.” After all, Mats and my former #5 world-ranked friend were only miserable after making millions of dollars and reaching the pinnacle in the game so I’m going down another road,” I concluded. What began to change as I shifted my perspective? I began to embrace the feeling of nerves and pressure. I began to experience more joy while competing. My perspective widened and I could focus more on what was “relevant” while playing. I could stay in the moment from point to point longer. I wouldn’t get as upset over errors and could move on quicker. I was less in my head and more in my body. Other than the age group, the only difference between Mats and me was that I wanted to keep playing because it was a blast. I experienced the ultimate win-win in my mind—I reached my potential and enjoyed it all along the way. The last ten years playing under this paradigm taught me more about myself, life, and tennis than the first 20. The result: My best days began to replicate. I would hit consistently deeper. I would win the “big” points more often. I could hit harder without losing the consistency. The speed on my serve increased because my arm was looser. I won more and reached the pinnacle of the game in my age group—number one in the world in singles, #1 in the U.S men’s singles and #1 in the U.S in doubles in 2002. 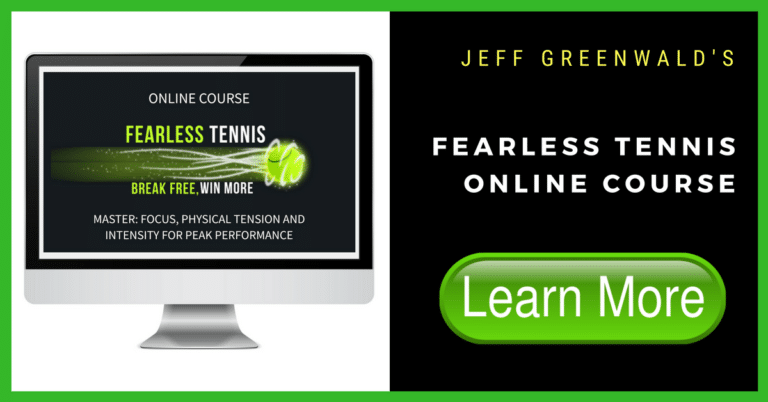 In the following five articles I will be taking you step-by-step through the five principles that helped me play the best tennis of my life. I hope you join me on this path so, you, too can experience what it’s like when you feel as though you are tapping your potential.